Sometimes less is more. A solid body with an added resonating chamber below the bridge defines the tone of the Bantronic Auricle. The piezo pickup situated inside of this chamber captures the sounds produced and brings them out to your amp. 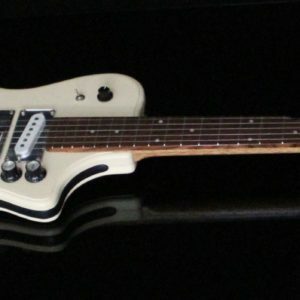 Simple controls allow you to switch between and combine the piezo and the classic humbucker pickups to shape your own unique sound. Play into the future with this timeless instrument. Substitute a five string neck to make this the perfect guitar for a banjo player. Other custom options available upon request. Custom orders may take up to 30 days to complete from time of payment. We will keep you updated on your order as it progresses.